Stay another night. Perhaps there is more to do in Gulgong? Would you like to see our rooms? 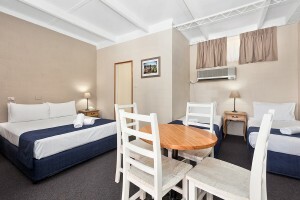 The Gulgong Motel is the place to stay to enjoy a quaint experience in Gulgong’s historic gold town. 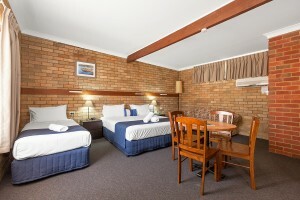 Gulgong Motel, is a quiet and peaceful place that is adjacent to Gulgong’s Anzac Memorial Park. Just a short 5 minutes walk to the downtown shops, restaurants and pubs on Gulgong’s “Mayne Street”. We invite you to come relax in one of our 19 ground floor units or swim in our sparkling pool. All units have dedicated parking. And for your comfort, all our units have en suite bathroom, wall mounted flat screen television and air-conditioning. All units come equipped with a microwave, toaster, kettle, fridge, hairdryer, iron and ironing board. Gulgong is rich in history. In town, you can see many buildings from a bygone era, still preserved for visitors. Not to be missed places to go to are: Gulgong Gold Experience, Gulgong Pioneers’ Museum, Henry Lawson Centre which captures the social and industrial history of this town, the Field Study Centre, and the extensive and beautiful Goulburn River National Park and the Red Hill Precinct. Some Heritage Buildings that are interesting to visit are Prince of Wales Opera House, the Courthouse, Post Office, County Council Chambers, the Police Station and Residence and numerous houses. Pick up a copy of the Gulgong Historical Walk & Henry Lawson Heritage Trail booklet for $2 from reception. 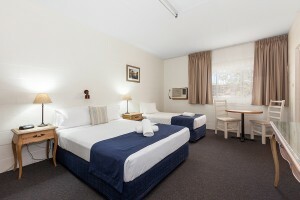 "Very clean with a good outdoor pool for those hot days.The staff are really friendly & it's just a short walk to town. We stayed two nights & the bed was comfortable. 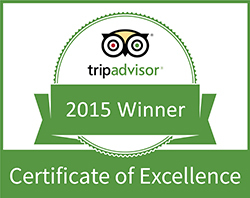 This motel offers real value for money and we will stay again when next visiting Gulgong." "Great value for money. Simple rooms, but excellent beds, handy to town and friendly staff. Great option for visiting Mudgee area wineries and attractions. We stayed there for A Day On The Green. Really relaxed pleasant spot." 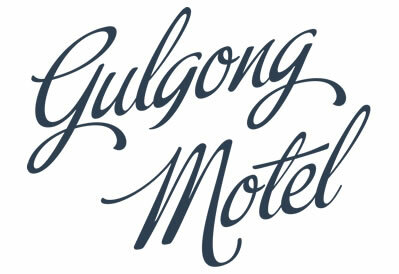 "Well after staying at the Gulgong Motel over the October 2015 long weekend cannot believe the improvements that have taken place there. Major renovations have lifted the standard of accommodation from pretty ordinary to I'll be staying there again next visit for sure. Well done Susan and Wayne, see you next time." "Great Motel. Rooms were spacious, clean and comfortable. Big bedroom with ample storage. Electric blankets were a great bonus as was the free wi-fi. Would highly recommend. Friendly staff and walk to everywhere. Would stay there again."